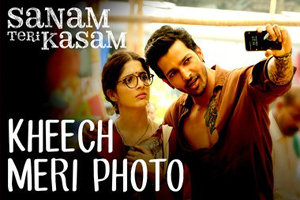 Masti bhare song sung by Darshan Raval, Neeti Mohan, Akasa Singh featuring Harshvardhan Rane, Mawra Hocane. The video of this song is available on YouTube at the official channel Eros Now. This video is of 3 minutes 26 seconds duration. Lyrics of "Kheech Meri Photo"
Lyrics in Hindi (Unicode) of "खीच मेरी फोटो"